This year’s end of season dinner was held at Tiggis in Clayton-le-Dale. An extremely pleasant evening to round off a very busy and successful season for Blackburn Music Society. 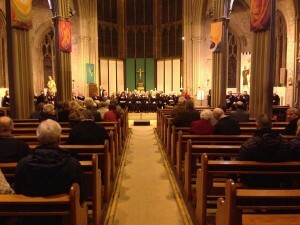 The summer concert in Blackburn Cathedral was most enjoyable, both for the choir and audience. Tom Newall was, as ever, an inspiring conductor and Sam Hudson gave a sterling accompaniment on the organ. On this occasion the soloists, apart from guest alto Timothy Braithwaite, a Cathedral Choral Scholar, were drawn from the choir and all did BMS proud with their outstanding voices and subtle interpretations of the music. The concert opened with a spirited rendition of Pergolesi’s Magnificat. 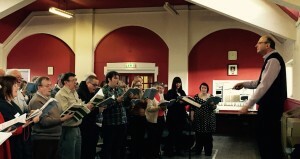 The soloists were soprano Laura Lenaughan, tenor Daniel Adams and bass Tom Young. Then followed Jamie MacRae performing two guitar solos: Ballade-Phantasy by twentieth century English composer Tom Eastwood and Valses Poeticos by Granados. Soulful and intricate, these perhaps were suited to a more intimate auditorium than the cathedral, but James rendered them with a skilful musicality. Mozart’s Laudate Dominum rounded off the first half with Laura Lenaughan’s beautiful soprano voice once again soaring to the vaulted heights of the nave and the choir joining in with an expressive Gloria. After the interval there was a treat in the form of a semi-chorus of choir members singing Italian composer Castelnuovo-Tedesco’s Romancero Gitano with Jamie on the guitar again. These gypsy ballads were written by the spanish poet Frederico Lorca. Full of fiery passion, they were performed with panache. And then a change of mood as the choir gave an energetic but sensitive rendering of Vivaldi’s Gloria, with soloists Laura and Timothy joined by Rachel Hoyle and Amy Venables. Finally the concert came to an end with a performance of Mozart’s Ave Verum, which was all the more moving as the choir sang without music. The choir attended the annual St George’s Day Service at Blackburn Cathedral and in addition to leading the hymn singing sang John Rutter’s arrangement of the blessing from the Book of Numbers, The Lord Bless You and Keep You. The Sea Symphony is amongst my all-time favourites. After last night’s performance I saw no reason to change my opinion. With the orchestra nicely settled after spirited renditions of Ravel’s Bolero and Britten’s Four Sea Interludes, the musical mainsail was hoisted and the choir ready to cast off on this epic journey. In the first movement ‘A Song for all Seas, All Ships’ that opening phrase: ‘Behold the sea itself’ with its brassy fanfare has captured my imagination since I first heard it in my early teens, and did again last night just as powerfully. The shanty-esque allegro painted a bracing picture of ‘dashing spray and winds piping and blowing’ before the mood changed to the lilting ‘chant for the sailors’. The dramatic entry of the soprano was followed by the return of the fanfare which then led to what was for me one of the most moving passages: ‘Tokens of all brave captains’. The reflective, nocturnal character of the baritone-led ‘On the Beach at Night Alone’ was conveyed by especially sensitive orchestral playing from bassoon and horns and a nicely restrained choir. The thrilling Scherzo ‘The Waves’ with its shifting tempi and dynamics is full of traps – mostly successfully negotiated, though the choir could have driven through crescendos more. But this was a minor detail – the movement was full of colour from an orchestra fully adjusted to the difficulties of the acoustic, and a choir confident in the clear beat of its conductor. The final movement ‘The Explorers’ plays with various moods before exalting us to ‘journey forth’ and although at times I felt both choir and orchestra could have been quieter, this was more than made up for by the exquisite semi-chorus as they asked the question ‘Wherefore, unsatisfied soul?’ How refreshing to hear this sung in tune! In the final section the soprano soared repeatedly above choir and orchestra as we were urged to ‘sail forth’ and then successfully pulled back to a well-controlled piano for the coda. Here the quiet picture of the ship gently disappearing over the horizon was brilliantly conveyed by the sensitive playing of the strings, especially the double basses. And what about Tom? Well, there can be no doubt he was a great captain, ably steering the choir through the choppy seas to a serene conclusion. To have done this with the choir disposed in two halves in the side balconies is no mean achievement. Equally, despite this handicap, the choir generally carried well. It was a delight to hear the sopranos sing so confidently and reach their numerous high notes seemingly without strain. Lastly, it was refreshing to see a young and enthusiastic orchestra that blossomed as the evening progressed. The brass section was particularly strong and consistently in tune, all helping to paint a wonderful picture. A collection taken at the concert raised over £100 for the Royal National Institute of Lifeboats. On Sunday, our intrepid conductor Tom took part in the the Great North West Half Marathon (13.1 miles/ 21 kms) in order to raise funds for the choir. 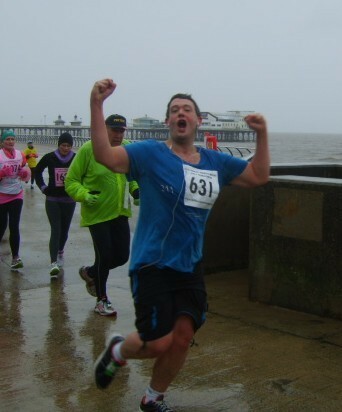 Despite being a novice runner and suffering the most appalling weather conditions – strong winds, heavy driving rain and temperatures below three degrees – Tom crossed the finishing line in less than two and a half hours, freezing cold, wet through, but jubilant. And well he might be. His herculean effort raised over a thousand pounds for choir funds. These were just some of the many enthusiastic verdicts on our day-long workshop on Vaughan William’s A Sea Symphony’ led by the eminent English choral music expert, Paul Spicer. From the moment of stepping out of the cold and into the warmth of Salesbury Memorial Hall, where guests and choir members alike were met with a friendly welcome, there was a buzz in the air. Of the 105 participants, 45 were visitors, coming from as far afield as Lytham St Annes, Morecambe and Leeds. The event drew several members of Oldham Choral Society, unsurprisingly since they too are preparing for a performance of this work, and also attracted singers from the Bolton Festival Chorus, who came purely for the delight of spending a day working on a marvellous piece of music with someone pre-eminent in his field. Despite being burdened with a heavy cold, Paul did not stint himself, but put us through our paces with patience and humour. He spent a considerable time on warm-up exercises, using it as an opportunity to give us some invaluable tips on vocal techniques, for example, that to sing a high note you need more space in your throat : ‘the opposite of organ pipes’ was Paul’s useful analogy. When it came to the music, rather than trying to get through the whole piece, Paul focused on sections, looking at them very closely, and not letting us get away with anything. It was this rigour that so many of the participants appreciated. ‘What I like about Paul is his attention to detail,’ said one singer. ‘He has such high standards.’ Paul’s high expectations encouraged us to rise to the challenge. Several participants commented on the agreeable social side of the day: ‘It was good to meet people from other choirs.’ And at each break there were drinks and an array of delicious cakes. What more could anyone ask? That the whole day ran so smoothly and was so enjoyable was owing to the tireless efforts of Tom, Joy, the Committee and other volunteers and helpers. Thanks are due to them with a special thanks toJoy for accompanying us. We could not have achieved what we did without her sterling work at the piano as she coped superbly with what even Paul acknowledged is a difficult score. This year our carol singing in B;ackburn Market raised £75 for Night Safe, a charity supporting homeless and vulnerable people aged 16-24 years in the Blackburn Area. About 60 choir members attended the annual East Lancashire Hospice Light up a Life Service at Blackburn Cathedral. The choir sang O Holy Night with soloists Laura Lenaghan and Emily Kennedy and Jingle Bells. A large group of choir members attended the 11.15am Mass at St Alban’s Church in Blackburn and sang the Fauré Requiem accompanied by 15 year old William Fielding on the organ. Blackburn Cathedral was packed for the world premiere of a classical piece of music by David Mellor. Shortly before Christmas in 1917, three boys aged 10, 16 and 18, left the Sunday School of St. Barnabas’ Church in Darwen and set off to walk across Darwen Moors. In the sudden blizzard that followed, all three died. David Mellor’s tone poem ‘Tragedy on Darwen Moor’ was inspired by their story. The concert was performed by the Northern Chamber Orchestra, Blackburn Music Society, the Cathedral Appeal Choir and children from St. Barnabas’ school, Darwen. Also included in the concert was F auré’s Requiem and a second work by David Mellor, his ‘Peace Anthem’, written in response to the events of 9/11. Darwen M.P. Jake Berry said, “Fabulous night, warm congratulations to everyone involved.”. Just three of the comments from audience members who, although small in number, were generous and unstinting in their praise of Blackburn Music Society’s evening of Remembrance in words and music at Pleasington Priory. We had assured and moving readings of three war poems: Sheila Cannings read For the Fallen by Laurence Binyon, Geoff Oldham read In Flanders Fields by John McCrae, and Krystyna Adams read Everyone sang by Siegfried Sassoon. Laura Lenaughan’s beautiful voice soared in ‘Pie Jesu’, and the Priory resounded with Tom Young’s dramatic performance of ‘Libera Me’ and our Musical Director’s first-rate performance of ‘Hostias’. There was a retiring collection for the British Legion Poppy Appeal. For some time the BMS committee members have been considering an alternative venue for rehearsals, as choir numbers increased and it became clear that the hall at Westholme School’s Beardwood Bank was no longer large enough for our needs. Our first rehearsal in the O’Neill Academy for Performing Arts Theatre at St Mary’s College was viewed very positively and enthusiastically by choir members and we are optimistic that we will have many enjoyable and productive rehearsals there in the future.